The 319th Air Base Wing is a United States Air Force unit assigned to the Air Combat Command. It is stationed at Grand Forks Air Force Base, North Dakota. The wing is the host unit at Grand Forks. The mission of the 319th Air Base Wing is to support "Global Engagement" operations. The wing provides support functions for Air Combat Command. The 319th Air Base Wing won the 2002 Solano Trophy on 26 April 2002 for the best active-duty unit in Fifteenth Air Force. The 319th Bombardment Wing was first activated in the reserve on 27 June 1949 at Reading Municipal Airport, Pennsylvania, when Continental Air Command reorganized its flying units under the wing base organization system, which put combat and support organizations on an installation under a single wing. The 319th Bombardment Group, which had been stationed at Mitchel Air Force Base, New York, moved on paper to Reading and became the wing's combat organization. The 319th Wing replaced the 322d Bombardment Group and other reserve organizations at Reading. The wing began training under the supervision of the regular 2237th Air Force Reserve Training Center, but the reserve program changed and it was decided that Reading would be home to troop carrier units. The wing was inactivated on 2 September and its personnel and some of its equipment were transferred to the 512th Troop Carrier Wing, which was activated in its place. The wing did not remain inactive long, but was reactivated on 10 October at Birmingham Municipal Airport, Alabama, where it replaced the 514th Troop Carrier Wing. It flew Douglas B-26 Invader light bombers and a variety of training aircraft, guided by the 2587th Air Force Reserve Flying Training Center. Unlike active duty combat groups, which were authorized three squadrons, the 319th's flying group controlled four combat squadrons. However, these squadrons were manned at only 25% of their authorized strength. The 319th performed reserve training until ordered to active service along with two other reserve light bomber wings on 10 March 1951 due to the Korean War. Once activated, wing personnel and aircraft were deployed as replacements to other units. It was inactivated two weeks later on 28 March. The reserve mobilization for the Korean War left the Air Force Reserve without aircraft, and reserve units did not receive aircraft until July 1952. Among the new reserve flying organizations formed in 1952 was the 8710th Flying Training Wing, which replaced the 905th Reserve Training Wing at Memphis Municipal Airport, Tennessee on 13 June. However, the Air Force decided that all reserve units be designed to augment the regular forces in the event of a national emergency, and the six reserve pilot training wings formed in 1952 had no mobilization mission. On 18 May 1955, the 8710th was discontinued and replaced by the 319th, now the 319th Fighter-Bomber Wing. Originally, the 46th Fighter-Bomber Squadron was the 319th's sole operational squadron, and it was equipped with Lockheed T-33 T-Birds for training reservists on jet fighter operations and Republic F-84 Thunderjets for operational use. Although titled a fighter-bomber squadron the squadron initially had an air defense mission, and from July 1956 through August 1957, maintained two Thunderjets on alert at Memphis. These two aircraft were under the operational control of the 20th Air Division of Air Defense Command. During the first half of 1955, the Air Force began establishing detached reserve squadrons at separate sites from their parent wing locations. The concept offered several advantages: communities were more likely to accept the smaller squadrons than the large wings and the location of separate squadrons in more population centers would facilitate recruiting and manning. As it finally evolved in the spring of 1955, Continental Air Command’s plan called for placing Air Force reserve units at fifty-nine installations located throughout the United States. In time, the detached squadron program proved successful in attracting additional participants As part of this program, the 319th added a second squadron, the 50th Fighter-Bomber Squadron, at Naval Air Station New Orleans on 8 June 1957. On 1 September 1958, Strategic Air Command (SAC) established the 4133d Strategic Wing' at Grand Forks Air Force Base, North Dakota, an Air Defense Command (ADC) base whose host was the 478th Fighter Group and assigned it to Second Air Force as part of SAC's plan to disperse its Boeing B-52 Stratofortress heavy bombers over a larger number of bases, thus making it more difficult for the Soviet Union to knock out the entire fleet with a surprise first strike. In January 1959 the 4133d was transferred to the 821st Air Division. The wing remained a headquarters only until 1 February 1960 when the 905th Air Refueling Squadron Flying Boeing KC-135 Stratotankers, three maintenance squadrons and a squadron to provide security for special weapons were activated and assigned to the wing. In March 1961, the 39th Munitions Maintenance Squadron was activated to oversee the wing's special weapons but it was not until 1 January 1962 that the 30th Bombardment Squadron, consisting of 15 Boeing B-52Hs, moved to Grand Forks from Homestead AFB, Florida where it had been one of the three squadrons of the 19th Bombardment Wing. Starting in 1960, one third of the wing's aircraft were maintained on fifteen-minute alert, fully fueled and ready for combat to reduce vulnerability to a Soviet missile strike. This was increased to half the wing's aircraft in 1962. The 4133d (and later the 319th) continued to maintain an alert commitment until September 1991. On 1 July 1962, the 4133d was reassigned to the 810th Strategic Aerospace Division. As a result, the 4133d Wing was replaced by the 319th Bombardment Wing, which assumed its mission, personnel, and equipment on 1 February 1963. [note 3] The 46th Bombardment Squadron, a squadron that had been assigned to the wing when it was a reserve organization, replaced the 30th Squadron. The 905th Air Refueling Squadron and the 59th Munitions Maintenance Squadron' were reassigned to the 319th. Component support units were replaced by units with the numerical designation of the newly established wing. Each of the new units assumed the personnel, equipment, and mission of its predecessor. Shortly after the wing was activated, Grand Forks was transferred from ADC to SAC in July 1963, and the personnel and equipment of ADC's 478th Air Base Group and 478th USAF Dispensary were transferred to form the wing's 319th Combat Support Group and 804th Medical Group. In 1964, however, the wing became a tenant of the 321st Strategic Missile Wing as its base support mission, manpower, and equipment was transferred to the 321st. The wing placed aircraft on peacetime quick reaction alert duty, and conducted global bombardment training for Emergency War Order operations and air refueling operations to meet SAC commitments. During the Vietnam War, the 319th Bomb Wing's mission expanded to include sending bomber and tanker aircrews on temporary duty assignments to support B-52 and KC-135 operations from 1963 to 1974. Tanker crews participated in refueling operations for both bombers and fighters. The bomb crews flew B-52Ds from bases at Andersen AFB, Guam; Kadena AB, Okinawa, and U-Tapao RTNAF, Thailand. Bomber crews participated in Operation Arc Light in 1968 and Operations Linebacker I and Linebacker II in 1972. In 1973, the 319th Bombardment Wing acquired the AGM-69 Short Range Attack Missile, replacing the older AGM-28 Hound Dog air-to-ground missile aboard its B-52Hs. As the activities in Southeast Asia decreased, the 319th Bomb Wing focused its full efforts on training crews to fly strategic strike missions. It participated in a SAC program to test admission of females to the inflight refueling career field, January–December 1979. The wing converted from B-52 to Rockwell B-1B Lancer bombers, 1986–1987 and flew training missions with conventional and nuclear configurations. Tanker crews assigned to the wing assisted in air refueling efforts during the invasion of Panama in December 1989. It deployed tankers to Oman, Egypt, and Saudi Arabia to provide air refueling and cargo missions in Southwest Asia, August 1990 – April 1991. In line with the changing international situation, President George H. W. Bush decided to reduce the US nuclear alert force. Thus, on 28 September 1991, the 319th Wing pulled its B-1B bombers and KC-135R tankers from quick reaction alert duty, ending nearly three decades of such activity at Grand Forks AFB. With the inactivation of SAC on 1 June 1992, the Air Force redesignated the 319th Wing as the 319th Wing and assigned it to the newly established Air Combat Command (ACC). At the same time, the wing's 905th Air Refueling Squadron and its KC-135R tankers were assigned to the 305th Air Refueling Wing at Grissom Air Force Base, Indiana, despite the fact that they remained physically stationed at Grand Forks AFB. Because it had lost its air refueling components, the wing became the 319th Bomb Wing. Still remaining at Grand Forks, the 905th was reassigned to the 43d Air Refueling Wing at Malmstrom Air Force Base, Montana, on 1 July 1993. On 1 October 1993 the Air Force redesignated the 319th Bomb Wing as the 319th Air Refueling Wing. The wing was reassigned from the Air Combat Command to the Air Mobility Command. 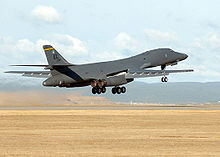 It also reacquired the 905th Air Refueling Squadron and its KC-135R tankers while turning over its B-1B bombers to the newly activated 319th Bomb Group, an Air Combat Command organization. 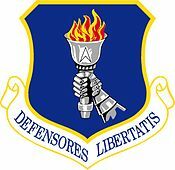 [note 4] On 1 February 1994, Air Mobility Command transferred the 906th Air Refueling Squadron from Minot Air Force Base, North Dakota, to the 319th Wing and on 1 April, the 912th Air Refueling Squadron moved from Robins Air Force Base, Georgia to join the wing. Lastly, the 911th Air Refueling Squadron was transferred from Seymour Johnson Air Force Base, North Carolina on 29 April 1994. After the September 11 attacks, the wing was the first to fly an Air Mobility Command sortie supporting the Air Force's response to the terrorist attacks by refueling the F-16 that delivered the Federal Emergency Management Agency director to New York only three and a half hours after the attacks. All of the 319th Air Refueling Wing's mission-capable aircraft were prepped, fueled and cocked within 24 hours. In March 2011, pursuant to a Base Realignment and Closure decision, the wing lost its operational manned flying mission and was redesignated the 319th Air Base Wing. In September, remotely piloted aircraft operations commenced when the 69th Reconnaissance Group of Air Combat Command, flying the RQ-4 Global Hawk, was activated at Grand Forks. Although the 69th is assigned to the 9th Reconnaissance Wing at Beale Air Force Base, California, it receives administrative and logistics support from the 319th. In recognizing that the wing's mission was now to support this mission, on 13 June 2017, the 319th was reassigned from Air Mobility Command to Air Combat Command. ^ "Factsheet 821 Strategic Aerospace Division". Air Force Historical Research Agency. 11 October 2007. Archived from the original on 30 October 2012. Retrieved 20 March 2014. ^ "Factsheet 810 Strategic Aerospace Division". Air Force Historical Research Agency. 11 October 2007. Archived from the original on 30 October 2012. Retrieved 22 March 2014. ^ a b c d e f g h i j k l m n o p q r s t u v w x y z aa ab ac Dollman, TSG David (20 October 2016). "Factsheet 319 Air Base Wing (AMC)". Air Force Historical Research Agency. Retrieved 17 December 2016. ^ Fontaine, Scott (1 March 2011). "N.D. wing undergoes name, mission change". Air Force Times. Archived from the original on 19 July 2012. Retrieved 21 December 2016. ^ Rupard, Wade (16 October 2015). "With UAS progress, return of tankers to GFAFB a possibility, Hoeven says". Grand Forks Herald. Retrieved 17 December 2016. ^ Robertson, Patsy (17 September 2015). "Factsheet 69 Reconnaissance Group (ACC)". Air Force Historical Research Agency. Archived from the original on 27 September 2015. Retrieved 17 December 2016. ^ a b Staff writer, no byline (13 June 2017). "Air Force realigns Grand Forks AFB under ACC". Air Combat Command Public Affairs. Retrieved 13 November 2017. This page was last edited on 31 December 2018, at 17:36 (UTC).